New Bags Comply With DOT and State Regulations for Interstate and Intrastate Transport of Biohazardous Waste, Including Strict Requirements for Florida, Pennsylvania and California. LIVINGSTON, N.J., Aug. 5, 2015 /PRNewswire/ — Medegen Medical Products, an Inteplast Group Company, and manufacturer of patient care and medical products, announces the availability of its new Dual-Tested Autoclave Bags for the sterilization, transport and disposal of biohazardous waste. The bags are manufactured with high-strength, polypropylene film using a proprietary process. They comply with the U.S. Department of Transportation’s (DOT) Title 49 Code of Federal Regulations (CFR) Sections 173-197 on regulated medical waste, and meet or exceed autoclave bag regulations for the interstate and intrastate transport of biohazardous waste for all 50 states. Developed and manufactured in the U.S., Medegen Medical Products’ Dual-Tested Autoclave Bags are ASTM D1922 Elmendorf Tear tested to exceed 480g of tear strength (MD and TD), and ASTM D1709 tested to exceed 165g of dart drop strength. The bags, which are used to decontaminate contents, can be autoclaved at temperatures up to 285 degrees Fahrenheit and feature an integral steam processing indicator that turns brown when autoclaved. “These bags address a need in the marketplace,” says Mike Sauer, marketing director, containment, Medegen Medical Products. “Compliance laws for biohazardous waste containment differ from state to state. Certain states including Florida, Pennsylvania and California require dual-tested autoclave bags and others do not. This can create challenges for hospital systems or labs with multiple locations. Our Dual-Tested Autoclave Bags comply with the most stringent and most current regulations nationwide. They offer peace of mind to distributors and healthcare professionals because they can be sold and used everywhere in the U.S.,” adds Sauer. 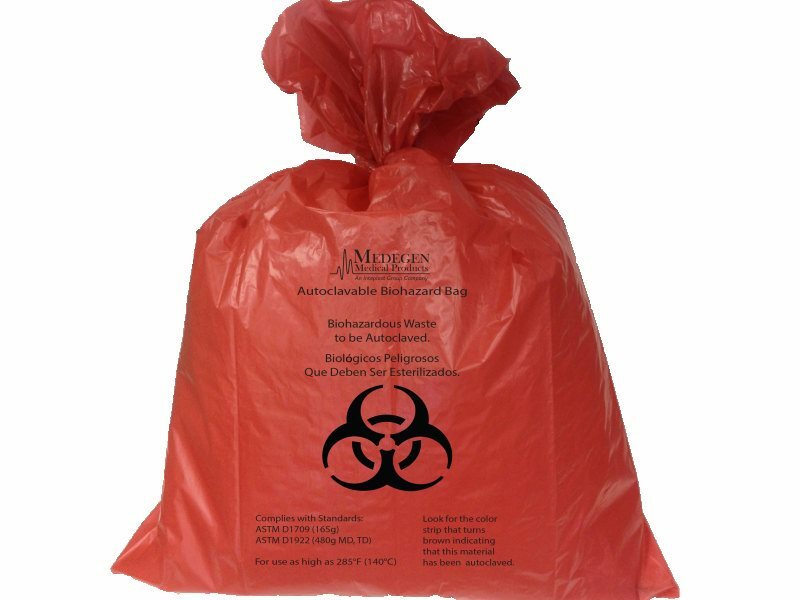 The bags are available in red color or clear and are imprinted with the biohazard symbol and warning in English and Spanish. Five sizes ranging from 14″ x 19″ to 38″ x 47″ are offered. Twist ties are included. Customization is available. Medegen Medical Products is well represented on Healthcare GPOs. The company’s dedicated nationwide sales team supports the entire line of Inteplast Healthcare products. As part of Inteplast Healthcare and Inteplast Group, Medegen Medical Products is able to offer its customers a wide breadth of products that deliver opportunities for system-wide standardization and cost savings. Medegen Medical Products has plants in Tennessee and West Virginia where it manufactures patient care and medical products for acute and alternate care facilities, including patient bedside items such as basins, bedpans and urinals; laboratory and measurement products; and containment systems for biohazard and non-biohazard waste including can liners, autoclave bags and sharps containers. Inteplast Group is a major U.S. manufacturer of integrated and synergistic plastic products for diverse markets. Headquartered in Livingston, NJ, Inteplast Group has more than 50 locations in North America, encompassing manufacturing, distribution and sales. For more information, please visit www.medegenmed.com and www.inteplasthealthcare.com.